Because meat is not part of a vegetarian and vegan diet, many people who eat this way have concerns that they will not get enough protein. 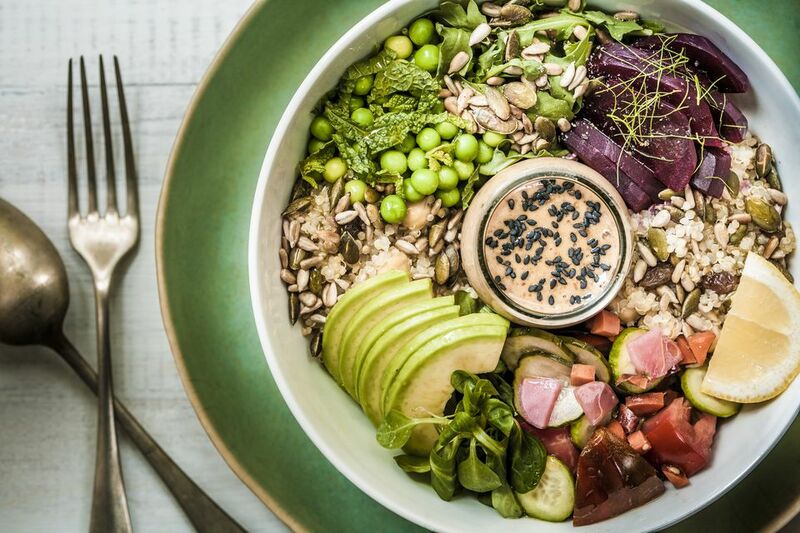 But there is no reason to worry—vegetarians and vegans can easily get enough protein in their meat-free diet, and may actually already be doing so without even trying. By incorporating tofu, quinoa, nuts, and beans into your vegetarian or vegan recipes you will instantly increase the protein in the dish and create a filling ​meal. From breakfast to lunch to dinner, there are a variety of recipes to keep meals interesting while leaving you feeling satisfied. Breakfast is a great meal to get some protein for the day—who doesn't need a boost in the morning? This comforting warm cereal is flavored with maple and cinnamon and studded with raisins, which may remind you (or the kids) of your favorite instant oatmeal. 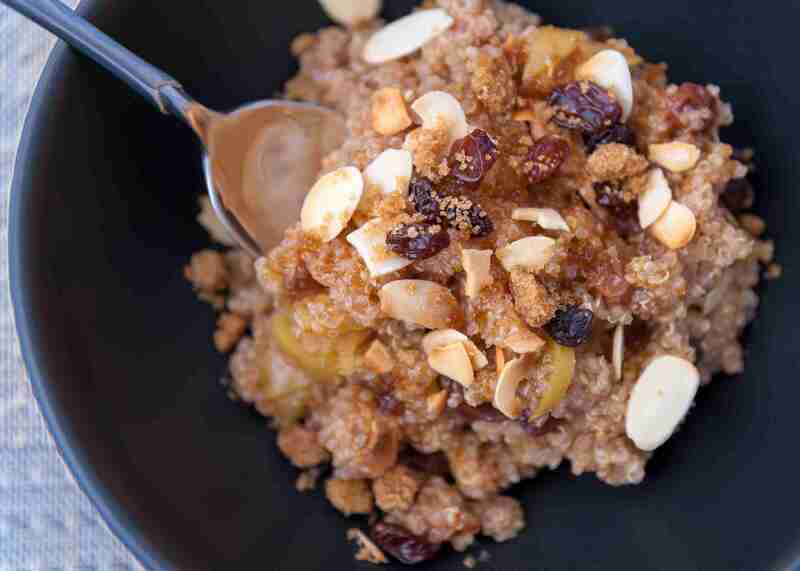 Made with quinoa instead of oats, this breakfast has about 30 percent more protein than traditional oatmeal. A great use for leftover quinoa or quinoa flakes if you're in a rush. Feel free to add berries or other fruits if desired. This breakfast dish, similar to a spinach omelet, has a bit of umami (one of the taste categories described as savory), giving it an unexpected but delicious finish. Tomatoes, garlic, mushrooms, and spinach are sauteed until tender, the tofu is added, and then everything is drizzled with a bit of soy sauce and lemon juice. With 10 grams of protein in a serving of tofu, this dish is sure to give you an energy boost to start your day. Just because you don't eat meat doesn't mean you can't recreate a dish with the flavors of sausage. By using a vegetarian sausage substitute, you not only have a dish with the traditional sausage taste but also one that is high in protein. Plan to start the recipe the night before so the mixture of sausage, egg substitute, soy milk, sauteed onion, and soy cheese can rest and meld together. Not only are these pancakes flavorful and delicious, but they also have the added bonus of being healthier than traditional flapjacks! The soy milk, tofu, and pecans add protein to the recipe while the apples bring a healthy dose of fiber and vitamin C. Simply blend ingredients, pour onto a hot griddle, and enjoy. You won't find any protein powder here but you will still get a protein boost—and that is due to the white beans that are blended with the pineapple juice, fruit yogurt, strawberries, honey, ginger, and nutmeg. With the beans' mild flavor you won't even detect they are there. This salad is loaded with protein from the bulgar wheat, edamame, and chickpeas. The edamame adds vibrant color and a wonderful texture, and the pesto, lemon juice, and parsley bring a fresh flavor to this Mediterranean-inspired dish. Topped with tomatoes, green onion, and feta cheese, this dish is pretty to look at and satisfying to eat. Serve alongside or inside pita pockets. Colorful and fresh, this bean and vegetable salad has the flavors of garlic, onion, parsley, lemon juice, and red wine vinegar, making it ideal for a summer cookout side dish. Any type of white bean will work, or you can substitute chickpeas if you like. A great alternative to the traditional three-bean salad! Fluffy quinoa and crunchy pecans—two great sources of protein—work well together to create complementary texture in this brightly flavored salad. The mint and parsley bring color and freshness while the lemon juice adds a bit of zing. Perfect for lunch on a warm summer day. You get a double dose of protein in this healthy and delicious wrap—first from the roasted red pepper hummus and then from the black beans. Vegetables such as mushrooms and corn add texture and nutrition while the poblano pepper brings a bit of smokiness to the recipe. Tempeh is a soy product that is bursting with protein at 18 grams per serving. When cooked and combined with vegan mayo, lemon juice, onion, celery, fresh parsley, and curry powder, it becomes a salad worthy to be served at a ladies luncheon. Place a scoop over a bed of lettuce, on an avocado half, or in between a crusty roll. For a twist on the traditional chili, try this hearty, vegan, and gluten-free version. The sweetness of the sweet potatoes is a pleasant counterpoint to the cayenne pepper, cumin, and chili powder. The black beans add a nice texture and good dose of protein, making for a satisfying stew the whole family may love. It is always good to have a lentil soup recipe under your belt. This healthy and flavorful version is not only vegetarian, but also low in calories, fat, and is gluten-free—so perfect for the entire family! The lentils are high in protein and make a comforting soup with a bit of heft. In Indian cooking, dal is a recipe that includes split peas or lentils. This spiced soup features yellow split peas, which are not only high in protein but also pretty when blended into a soup. The split peas are cooked in water or broth along with turmeric and cayenne and then topped with onion sauteed in cumin and clove, making for a healthy and very flavorful dish. Even if you are not a vegetarian you will want to try this tortilla pie-style dish. Seasoned black beans and cheese are layered between tortillas and then baked until gooey and hot. When topped with tomatoes, olives, avocado, and sour cream, this high-protein dish is hearty, nutritious, and satisfying enough for even the meat-eaters at the table. Not only is this lasagna high in protein, vitamins, and minerals, but it also cooks in the crockpot! The tofu (silken and firm) is blended with soy milk and seasonings, creating a mixture similar to the ricotta cheese and egg combination used in traditional lasagna. Spinach is folded into the tofu mixture​ and then layered with tomato sauce and noodles in the slow cooker. Six or so hours later, vegan lasagna! If you have had to give up Chinese take-out since becoming a vegan, this recipe is for you! High-protein tempeh joins pineapple and bell peppers in an Asian-inspired sweet and sour sauce made of soy sauce, pineapple juice, vinegar, brown sugar, and cornstarch. All you need is some rice and a set of chopsticks. Get your burger fix with these black bean burgers packed with protein. Mashed beans are combined with sauteed onions, seasonings, crumbled fresh bread, and a little flour and then formed into patties. These may not hold well if placed on a grill (you can put a piece of foil underneath), so pan-frying is best. Place on a sesame seed roll and add your favorite toppings. If you have a craving for comfort food, this vegetarian "meat" loaf is sure to be the cure. The lean ground beef substitute is where you'll find the protein, and when mixed with onion, garlic, bell pepper, seasonings, ketchup, dry mustard, brown sugar, as well as oatmeal and nutmeg, it may be the best "meat" loaf you've ever tasted. This pasta dish is hearty, nutritious, and packs a protein punch. Navy and kidney beans along with chickpeas simmer with onion, garlic, peppers, and tomatoes, then this mixture is combined with cooked pasta. Everything is tossed in a creamy spinach sauce made with soy milk.